Finally, Webappers has a complete site redesign today. As you can see there is a hugh difference between the old design and the current new design. 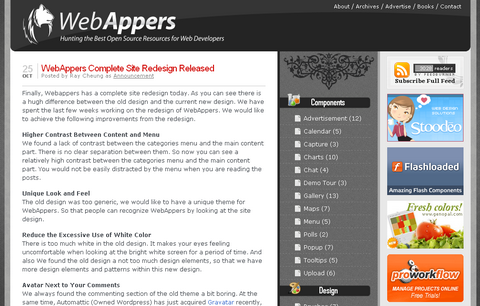 We have spent the last few weeks working on the redesign of WebAppers. We would like to achieve the following improvements from the redesign. We found a lack of contrast between the categories menu and the main content part. There is no clear separation between them. So now you can see a relatively high contrast between the categories menu and the main content part. You would not be easily distracted by the menu when you are reading the posts. The old design was too generic, we would like to have a unique theme for WebAppers. So that people can recognize WebAppers by looking at the site design. There is too much white in the old design. It makes your eyes feeling uncomfortable when looking at the bright white screen for a period of time. And also We found the old design a not too much design elements, so that we have more design elements and patterns within this new design. Compared to the old clustered footer, the new footer is much simpler and useful. We are trying to separate Components Resources and Design Related Resources on the Right Hand Side Categories Menu. Currently, the categories menu is a bit messy. I hope the new theme can improve the usability of WebAppers. We are still doing some little modification to the new theme. If you have any opinions, please feel free to leave a comment. Thank you very much for all of your support. You did a very nice job. I love the new design and it was well overdue. Keep it up. I like this new design, it’s much easier to find categories in the menu (before, it was “mixed” between posts and ads). Great job for a great blog! Very nice! Love the Damask Patterns! Looks good guys, keep it up. Nice on! :D At first I got shocked when you told me about revising the design.,but now that i see it… IT ROCKS! Webappers is gonna be huge! Love the new categories & footer. The tiger logo is much better than the dragon you showed me in your design. Although i’m not quite sure about the repeating background gradients. The new design is clean and easier to read !! Personally I didn’t find anything wrong with the old one, however that being said I don’t dislike the new version either. I read about the redesign yesterday and was curious about the new one. In my oppinion you did a good job not changing too much on the layout and emphasizing the categories more. A clear plus on usability. And the look is also very nice. Well done! Congratulations Ray, new design looks great.. Thank you for all the valuable comments. Greater distinction between stories on the front page would be nice. Oh and some tab indexes on the comment box so when I press tab from this box it should go to the “Post Comment” button! The visual separation is great, I like it alot. I don’t mind the patterns, but the thing that is ITCHING me is that animal head, serviceing as some sort of logo. Trust me, you don’t need that, and pardon my harsh language – it looks very amateur. Plus, it doesn’t add anything to the WebAppers identity. Nice Job!… Congratulations :) i like the new design. Ohhh… very nice redesign! Though I’d typed in the wrong address for a second there. Keep up the great posts! Wow! Congrats, the new theme looks great, nice work! I think I may be the first to add constructive criticism! I like the design, but it now seems to bland to me. I think it could benefit from some color in the header or highlights in other areas of the site. Just a thought! Nice work! More clean and easier to read. Good work guys, it looks so much better. Excelente sitio.. los felicito hacen un muy trabajo.. los sigo siempre. Keep rocking! Great job guys! The site rocks! i love this design, the categories sort of easier to be reached. luv the flower motive above the categories. but just the colours and the floral art dont look good i feel . Congratulations! This design is very pretty! I was very nervous about the launch of redesign, I was worrying if you guys would like/dislike the new design. I think I can relax now because it seems like you guys are very happy with the redesign. Love the redesign! Also Gravatars are a awesome! Great work guys. I just realized about the redesign and personally I did not like it, I think you should keep simple some things, anyway keep up the good job. Congratulation, it was very interesting surfing around here, It was a great pleasure for me to visit and enjoy you site. Keep it running!